11/25/13 UPDATE ARTICLE BASED ON NEWLY-AVAILABLE DOCUMENTS: Why did actor David Hasselhoff lie to me about his role with a shady nonprofit now under investigation for "possible $9m misappropriation"? Screenshot from grant applications signed by Carol Spizzirri for $200,000 awarded by the IL Dept. of Commerce and Community Affairs to buy SALF an office building in Springfield, IL. Click here for a related 3/14/13 WCIA-TV investigative report. Is Carol Spizzirri a Sidebar reader? Based on the following, it sure looks like it. Spizzirri's the founder/president of the Save-A-Life Foundation (SALF), the ethically-challenged Chicago nonprofit that's been the subject of dozens of media exposes and is reportedly under investigation by the Illinois Attorney General for the "possible misappropriation" of $9 million in federal and state tax dollars. On July 23, I reported that actor David Hasselhoff denied claims made for years by Spizzirri's organization that he supported SALF and served on the organization's board as "Honorary Chairman." For years SALF made the claim in grant applications, fundraising materials, and in the media -- including three Chicago Tribune articles published between 1993-2009. 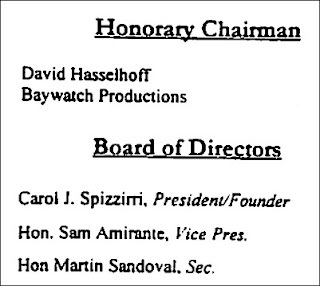 He was never SALF's Honorary Chairman. He never had any financial relationship with SALF. He never had any personal contact with SALF. I'm not sure what to make of her posting what I'm guessing is a 20-year-old snapshot. 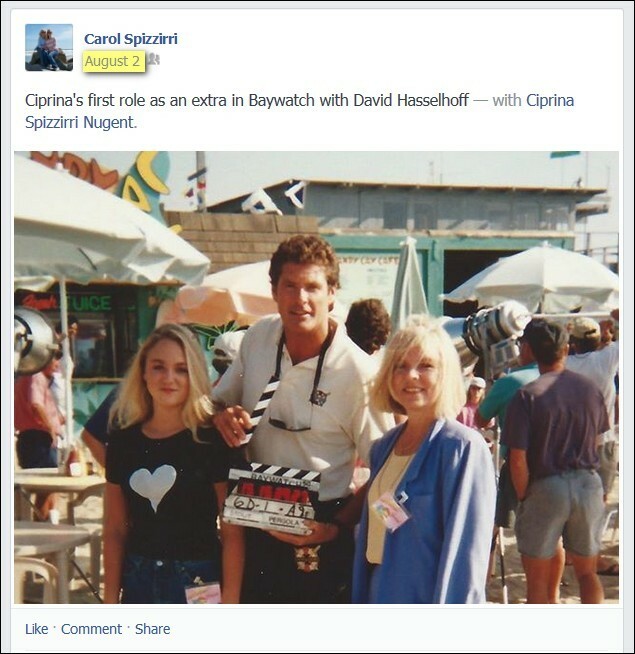 Did Spizzirri -- reportedly a serial embellisher with a sordid past -- spin her daughter's puny role as an extra in a Baywatch episode into claims that for years David Hasselhoff was closely involved with her organization? I dunno, but, Ms. Spizzirri, if you're reading this and want to respond to Hasselhoff's assertions that your organization lied about him, please feel free to e-mail me and I'll publish your response. Also, since you're apparently a Sidebar reader, you already know this, but supporting documents are always welcome.